I had the opportunity to take six bullet 6.8 SPC combinations to the range and test terminal performance. My goals was to verify the bullet I would be using for deer and hogs. I tested performance using a bullet “trap” that I have used for a couple of years. The trap consists of a gallon jug of water (typically an empty milk jug) in front of a box of phone books and magazines. The water jug provides the hydraulic medium to effect bullet expansion/mushrooming and the box catches the bullets and provides relative penetration performance. I’ve used this bullet trap with .223 Rem to .300 Win Mag and have seen similar results on elk I have harvested with a .270 Win. With that said, I realize this method of testing is not as good a medium as ballistic gelatin but that’s a whole other story and to inconvenient to use as a private individual. More details on the bullet trap can be found in this on-line article. Note, I now use a single phone book in front of multiple magazines like G&A, Shooting Times, etc. These are the bullets and their respective muzzle velocities shot from and 18-inch PSA SS SPR barrel. There was a 15+ mph headwind and the temperature was 48F. Here is a picture of the 6.8mm (0.277”) bullets used with some .270 Win bullets I typically load on the right side for reference. The results were more than interesting as you can see in the picture below. Note, I had only worked up loads for the 95 TTSX. All the other bullets arrived from Midway the day before and I loaded up enough rounds at a safe powder charge to put 2 on paper to judge POI then one into the trap. I plan to work up my loads for accuracy and velocity prior to repeating this test at longer range. 85gr Barnes TSX - perfect expansion. After testing numerous Barnes and Hornady GMX monolithic bullets in various calibers, I expected nothing less. 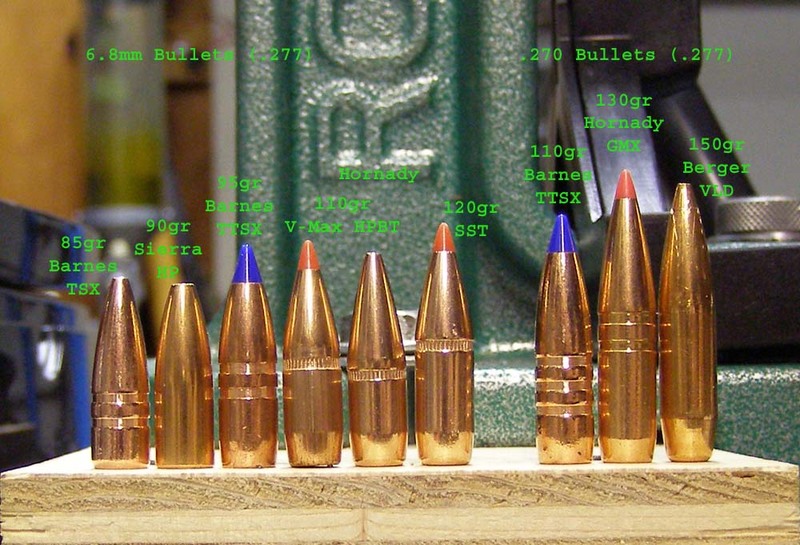 Every one of these bullets I have shot has had reliable and flawless expansion with 100% weight retention. The penetration was not quite through the phone book (note, the velocity is less than what I would expect after I develop this load). 90gr Sierra HP - completely fragmented, did not penetrate into the box of paper, and was not recovered. This wasn’t surprising for a varmint HP. 95gr Barnes TTSX - this is the bullet I had planned to hunt with before I even started my 6.8 project. I bought the others to have a comparison and learn more about my newly built rifle. This bullet did not disappoint and shows why it has such an excellent reputation in the 6.8 community. It mushroomed to 0.556” – the largest I have ever recovered including .308 caliber bullets. It was fully expanded and as you can see was shorter than the 85gr TSX. It penetrated through the phone book and one magazine. Note, my .270 GMX bullet penetrates through 7 more magazine issues. This will be my go-to bullet for hunting deer with a 6.8 SPC. 110gr Hornady V-Max - the bullet flattened, barely made it through the water jug, and was laying on the ground in front of the box. Only 52 grains of the bullet remained. IMO, not the best bullet for deer or hogs. 110gr Hornady HPBT - fragmented and went ½-way into the phone book. The jacket separated from the lead core and the largest fragment recovered was 32gr. I plan to use this one as my general purpose/target shooting bullet. Just wanted to see what it would do. 120gr Hornady SST – this was the biggest surprise for me. I thought this bullet at this low a velocity would have retained more weight. The jacket separated from the lead core and the largest fragment recovered was 30gr. It was hard to distinguish from the Hornady HPBT. The 30gr lead fragment did make it through the phone book and into 3 magazines, however, I have often found a projectile with a smaller diameter will penetrate further than a larger diameter projectile with more energy, e.g., I’ve had a 130 gr .270 Win GMX out penetrate the a 165gr .300 Win Mag GMX. I anticipate this bullet will perform better in a longer range test when it is at a lower velocity. - The expansion must be very rapid for both the TSX and TTSX as the jugs jumped over 10 feet away while all the other bullets only moved their jugs 2 or 3 feet. - In the case of the 95 TTSX, I wouldn’t be concerned if I need to drop velocity a bit to achieve better accuracy for my particular rifle. Based on this performance, I believe it will open up/mushroom at the advertised 1600-1700 fps. - There were many small lead fragments, more like flakes embedded in the paper that were not recoverable. I know that fragmentation is lethal, however, I have found that penetration and the path of penetration is not always reliable or predictable with lead-core bullets that fragment like this. I’ve seen a Core-Lokt shot from a .300 Win Mag fragment and not even penetrate the outside of the cardboard box. I also don’t like to lose meat to lead fragments. I’ve watched a butch remove an elk’s shoulder and toss it because it was full of lead fragments. I always lost the far shoulder when I hunted deer with fragmenting Fusion bullets. - I would expect that a bullet like the Nosler Accubond with is bonded lead core would have retained its core and ultimately had better weight retention. I may have to look for an opportunity to test one of these bullets. The testing isn’t over. I need to work up loads optimized for my rifle and head back to the range to test more, likely 300 yards. That may not be for a couple of months will all the activities coming up. great post Slim. the 110 grn hornady hp flat base projectiles I used for wallabies blew to pieces too but they sure killed those varmits well if very messy. most times a 1ltr sized hole and heaps of bruising/gelled tissue damage. are you not a nosler ballistic tip fan??? they SHOULD be good at the velocities you are looking at and alot cheaper than the barnes. A mate of mine took a cow elk with his 6.8SPC AR15 & 110gr Barnes TSX bullets. Two quick shots & fell where it stood. I've seen the same bullet type but .30cal 168gr boat tail drop a cow elk at just shy of 700yds too. They're a very versatile bullet design. A mate of mine took a cow elk with his 6.8SPC AR15 & 110gr Barnes TSX bullets. Two quick shots & fell where it stood. You have to watch how the 110gr Barnes TSX is used in a 6.8 SPC. 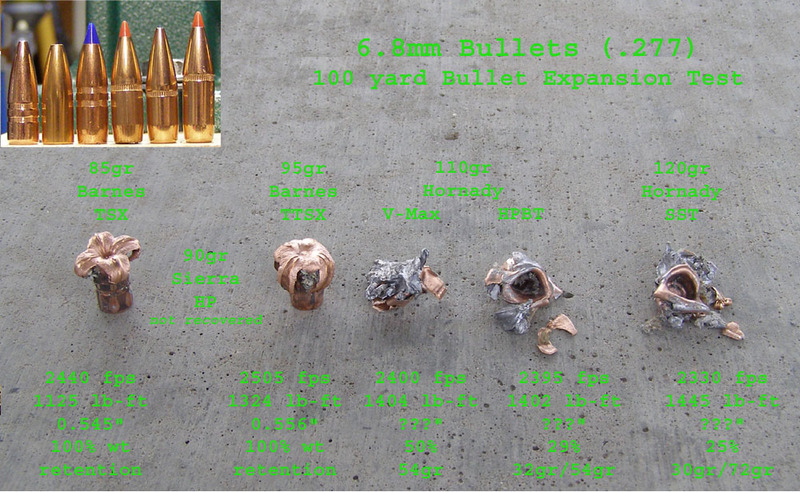 TSX bullets have to have 2100 fps or more on impact to expand. Because its copper instead of lead-based, its about as long as 130gr bullet eating up powder volume. Average muzzle velocities are just over 2400 fps which doesn't leave much margin. If the distance is much beyond 100 yards, over-penetration occurs. The 95gr TTSX starts opening at 1600 fps plus starts out about 400 fps faster providing 900 fps more margin. That's why the 95 TTSX is such a great round for the 6.8 SPC.